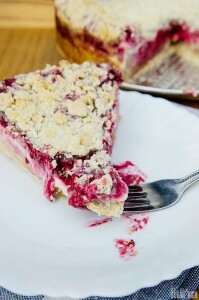 If you are looking for an amazing raspberry cake recipe, look no further! This recipe from Joanne Andrea is definitely a keeper. Joanne’s best friend came by and took some of this cake to her workplace and much to her delight, the women there loved the cake. A coworker actually tracked her down on facebook through her friend’s page, to comment that this Raspberry Cream Cake was the best raspberry cake she’s ever had! Of course that always makes any bakers day, doesn’t it? Sprinkle 2 tablespoons of sugar over the raspberries, mix together and set aside. Empty cake into a bowl. With a fork, cut in the butter and egg until the mixture looks like sand. Reserve ⅓ of the mix and spoon the rest into a 9” greased SPRING FORM baking pan. Begin to press the mixture into the bottom of the pan quite firmly to form the base. Bake the base for approximately 10 minutes. Meanwhile, beat cream cheese, egg and sugar in a bowl until soft and creamy. Set aside. When cake base is done, remove from oven. When cooled, spoon the cream cheese mixture over the base, spreading it evenly to that it reaches the sides. Follow up with the raspberry mixture, spooning it over the cream cheese mixture. 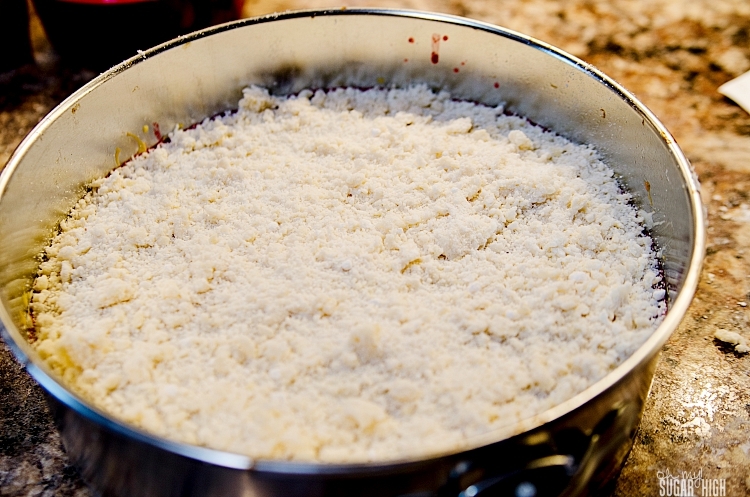 Lastly, take the reserved ⅓ of the base mixture and sprinkle it on the top of the cake to form the “streusel” type topping. Bake 35 minutes or until the center of the cake is barely moving. Let cool and then refrigerate to set, approximately 2 hours. Enjoy! 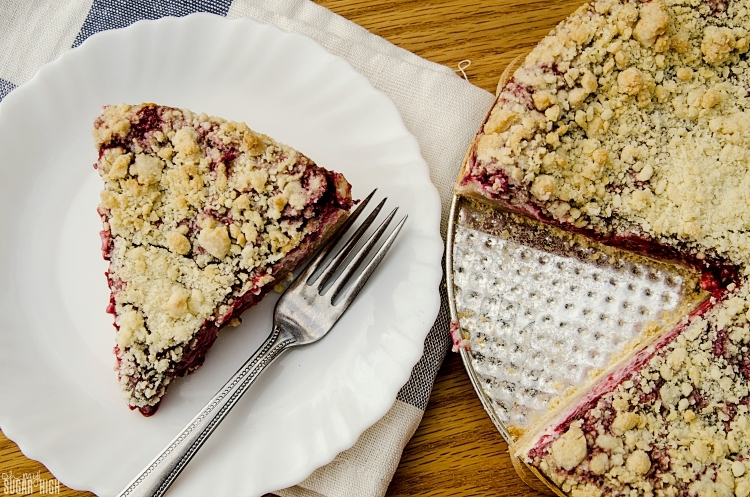 If raspberries aren’t a favorite fruit or you simply want to switch things up, try substituting other berries such as blueberries or blackberries. You could also get all crazy and do a mixture of fruits. Why not? This is a great way to use up some frozen fruit leftover from your summer harvest. I love that you can make this year round, even when these fruits are out of season. Thanks for sharing this awesome recipe, Joanne. Now I’m drooling all over my keyboard. What a pretty and delicious dessert option- I LOVE raspberries! It’s nice to see this among the sea of apple and pumpkin recipes out there now! 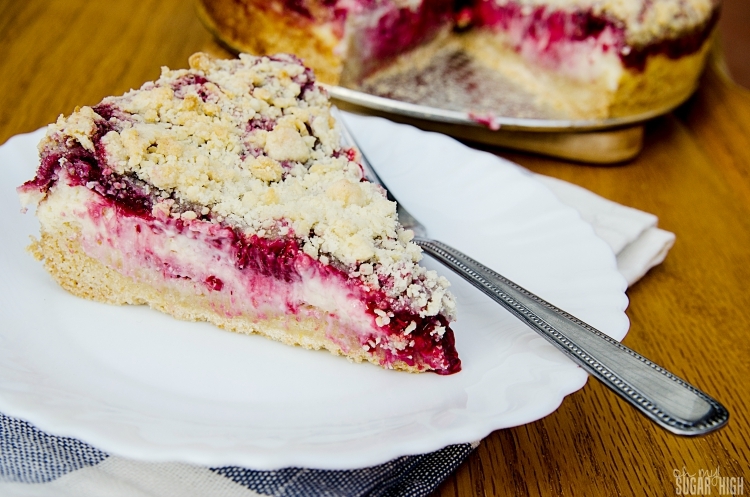 Raspberry is one of those fruits that taste delicious in cake! 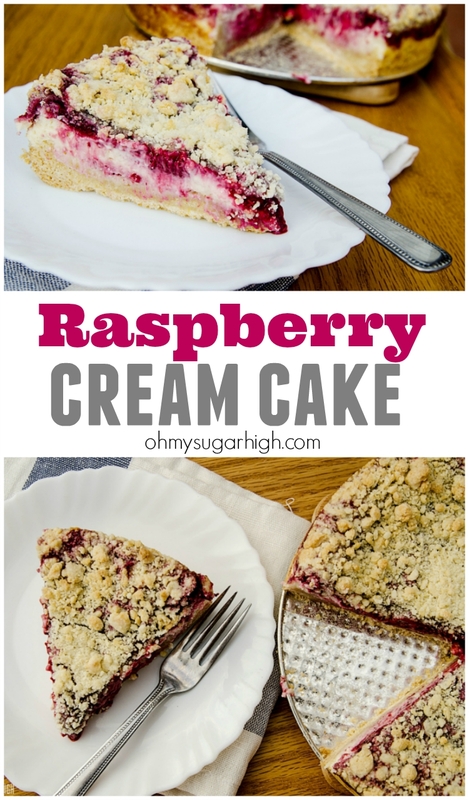 This raspberry cream cake is the perfect dessert! I like to serve mine with homemade whipped cream and a scoop of ice cream.